Canon Digital Rebel (modified for IR), EF 17-40 f4L @ 20mm 1/200s, f/9.0, ISO100. Captured in jpeg, channel swap, level and sharpen in Photoshop. 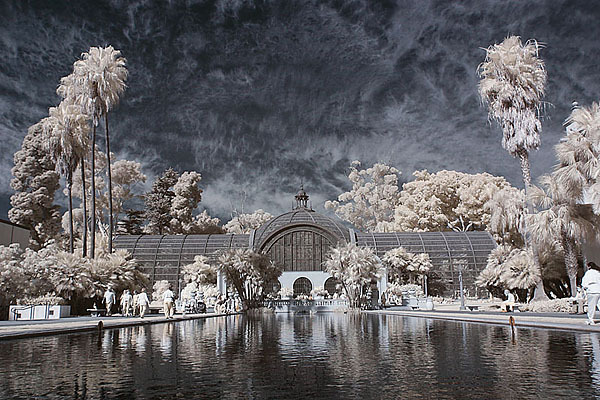 Have you ever tried infrared photos? The sky is dark, the foliage is glowing! The skin is smooth! These give your photos a surreal, ethereal feel! Now you can do it with a digital camera, in the same way as you take color photos! You can do it hand-hold, auto-focus, and do not need expensive infrared filters! 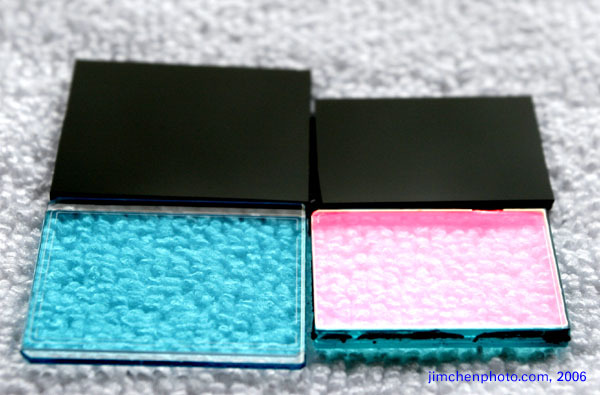 The internal UV-IR blocking filter of D50 (blue, large), Digital Rebel (red, small), and substituting infrared filters. The CCD or CMOS sensors of digital cameras are actually very sensitive to infrared light. Since the infrared light focuses differently than the visible light, the maufacturer puts a UV-IR blocking filter in front of the sensor to prevent the infrared light from messing up the color images, especially images like the warm "candle light" scene. As you can see from the transmission curve of Canon Digital Rebel and Nikon D50, the internal filters only let light between 350 nm and 700 nm pass through. Different digital cameras use different filters. Some older cameras, such as some Olympus models cut infrared less aggressively. For years, photographers have discovered to put an IR filter in front of the lens of digtal cameras to filter off the visible light and take infrared photos. However, most current digital cameras cut the infrared light very aggressively. Hence, not much infrared light can pass through the internal filter. In order to capture the infrared light (sometime, even the dark red) more efficiently, the internal blocking filter must be modified. For example, Canon even makes a special edition of 20D, 20Da (20D for astrophotography) just to increase the transmission of Hydrogen alpha (deep red, 656.28 nm), which is even shorter than the starting of infrared (above 720 nm). As you can see from the transmission curve of the internal filters, the transmission of the internal filter in the infrared region is very minimal at most. 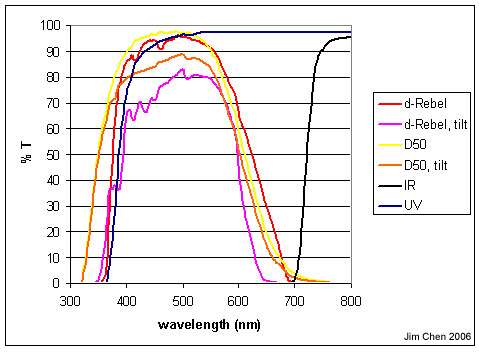 The transmission curve for a UV, Hoya R72 IR filter and the internal filter of D50 and Digital Rebel. The internal blocking filter of digital camera cut the IR so agssively that almost no IR can get through! The Digital Rebel filter looks red at an angle, because it actually absorb and reflect red and infrared light. Since not much infrared light can go through the internal UV-IR blocker, it is not a suprise that it takes many seconds (about 30s for me) to take an infrared photo with the infrared filter mounted on the lens. Also, an external infrared filter makes it very difficult to compose and focus. Digital Rebel (300D), Modified for IR. EF 17-40 f4L @ 22mm, 1/100s, f/10, ISO 100. Left: original jpeg; Right: channel swap in Photoshop. Some curve and sharpen applied. Objects reflect different amount of infrared light than the visible light. This makes the infrared images different from the visible light images. Cloud reflects a lot, while the sky reflects very little. So it is always very easy to get interesting looking clouds. In infrared, I will never have to use a GND filter to hold the sky back. The skin looks very smooth in infrared. 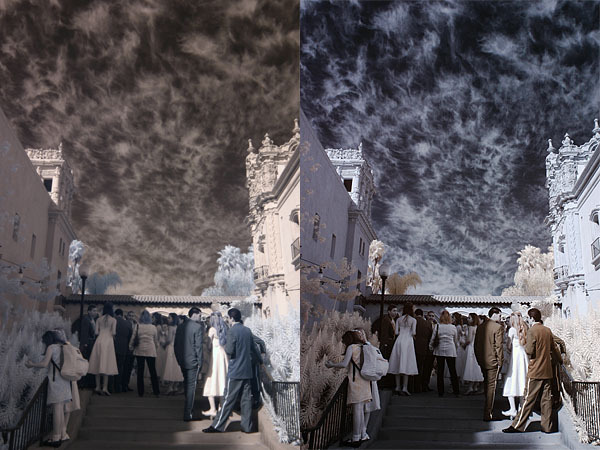 So smooth that some wedding photographers like to take portrait of brides in infrared! Can you distinguish the foliages from the snow? Cautions must be taken with foliages, because they reflect too much! It is very easy to over expose them! Generally, I concentrate on composing and let the camera do the metering. I usually will check the exposure, especially if there are many foliages in the viewfinder! 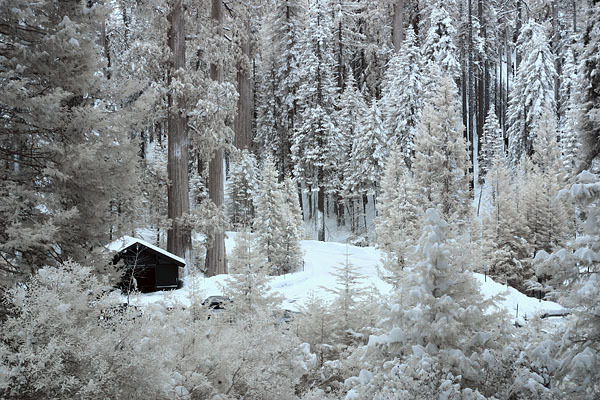 In IR, I treat the foliages like snow in color. Well, the cameras will likely underexpose the snow, but overexpose the foliages! The flemingos are white! Because they reflect too much red and infrared light! Digital Rebel (300D), Modified for IR. EF 70-200 f4L @ 70mm, 1/500s, f/4, ISO 200. Color may show up in different brightness. Even similar colored clothes may show up differently. Or, different colors show up similar. Can you imagine what will the Stop sign in your driveway look like in infrared? 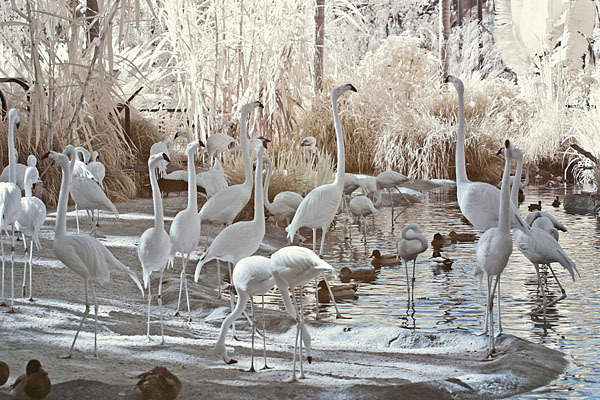 (hint: the flamingos look white.) I guess I could use my camera to check if my "pre-owned" car has some non-original but same colored paint on the bumper! Yes, it has. Now take as many infrared images, easy and free! Please shoot me an email if you have any questions, and I will reply as soon as I pick up some wifi signal! © Jim Chen and Friends 2006-2010 All rights reserved.